Why Everybody Needs "Everybody Needs Training"
Throughout my childhood, my brother Danny was one of my biggest inspirations. When I look back, it’s easy to see Danny’s influence in a lot of my early choices. Danny listened to heavy metal, so I listened to heavy metal. Danny played the drums, so I played the drums. Danny got a tattoo, so I had to get some ink, too! Danny even got into working out before I did. After all, I was the little brother - it was natural for me to emulate a lot of what my big brother did. People are often surprised to hear that Danny’s older than me. Between his youthful exuberance and that thick head of hair, many assume he’s younger. When Danny and I were kids, however, there was far less confusion. The half-decade age gap between us was a lot more significant back then. After all, when you’re only five years old, a ten year-old is double your age! Now that we’re both in our thirties, the disparity seems to matter a lot less. Growing up, Danny helped me learn a lot about life, relationships, and the world at large. Though I followed in his footsteps during my formative years, I was the one who started in the fitness industry first. In adulthood, I helped convince Danny to change careers and become a personal trainer. It was cool for me to be the one who inspired him this time - I was excited to return the favor. Funny thing is, a lot of the life lessons I learned from Danny early on helped me be a better personal trainer. This is part of why I knew he would be so good at it! When Danny began working at the gym where I had already been employed for some time, suddenly our co-workers knew him as "Al’s Brother." After spending my teenage years being known as "Danny’s Brother" to everyone in the neighborhood, having the roles reversed felt very strange. Yet just like our age disparity didn’t matter once we were both adults, it didn’t take long for Danny to catch up as a trainer and establish an identity in the fitness industry that was all his own. In fact, Danny built his personal training career faster than just about anyone else I’ve ever met. He went from being brand new to the business to becoming one of the busiest trainers in one of NYC’s top facilities in less than one year. Danny is the type of guy that will succeed at whatever he puts his mind to. He’s stubborn in the best possible way and he has a better work ethic than 99% of people I’ve ever met in my life. Whether it means waking up at the crack of dawn or working til the wee hours of the night, Danny is willing to do whatever it takes to get the job done. Once he decided to pursue an opening in fitness management, he went on to make a huge reputation for himself in that field as well. It wasn’t long before people in the industry got to know the name Danny Kavadlo for his personal accomplishments and expertise. Being my brother was irrelevant. complete confidence that Danny was capable of creating a great book like this one and I'm proud to have helped give him the push to do so. After having now read the book, it’s even better than I thought it would be. Danny’s anecdotes and advices are entertaining, informative and insightful. Yet even more than that, his honesty is bold and refreshing. Though much of what you’ll read here might seem like common sense, other things may surprise or even shock you; some people may not be ready for all of the cold, hard truth about the personal training industry that you’ll find in these pages. Everybody Needs Training is the real deal on the fitness business directly from someone who’s done it all. 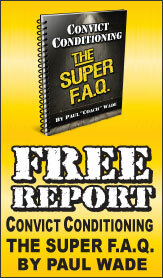 It’s a must-read for any serious minded personal trainer. Danny has laid out a stellar blueprint for fitness industry superstardom; implementing his advice is sure to take your training career to the next level. Of course, as Danny will tell you, it’s not going to come easy - you’re going to have to hustle! If fitness is what you live and breathe, however, everything you need to do to make your dream job a reality is in these pages. Just remember to keep an open mind - it might not be what you expect.